I’ve cried enough tears over the loss of my vision to end the drought in California. The shackles of sadness that held me to the ground as I grieved were rarely unlocked. When I thought about ALL the fears I had, and still have, it paralyzed me. The fear of venturing out alone has been a big one! I just couldn’t picture myself being out and about town on my own…with no one else…by myself! Like everrrr! That would be stepping way out of my blind comfort zone. Yep, *shakes head* too scarey out there. Personally, I had to build up a strong supply of big girl courage to help bust out of the zone. I needed confidence if I was to attempt a solo adventure. I know other blind kids do it and I wondered when I would be ready. When would I be strong enough to take the step and leave those shackles behind? This morning, for whatever reason, I felt ready. Maybe it was the extra cup of coffee, but I felt pretty confident about my ability to handle the uncomfortable… alone. It’s not that I don’t like the company or the help of other people…. I needed to do this with just me, myself, and I. Gaining back some of the control that I craved. Well, minus the driving or decent eyesight parts! Okay… I obviously can’t drive, so I called Uber. I grabbed my purse filled with a whole bunch of big girl courage, some extra confidence, and my white cane. I headed out of my comfort zone and into the wild blue yonder, where the sweet smell of independence fills the air. 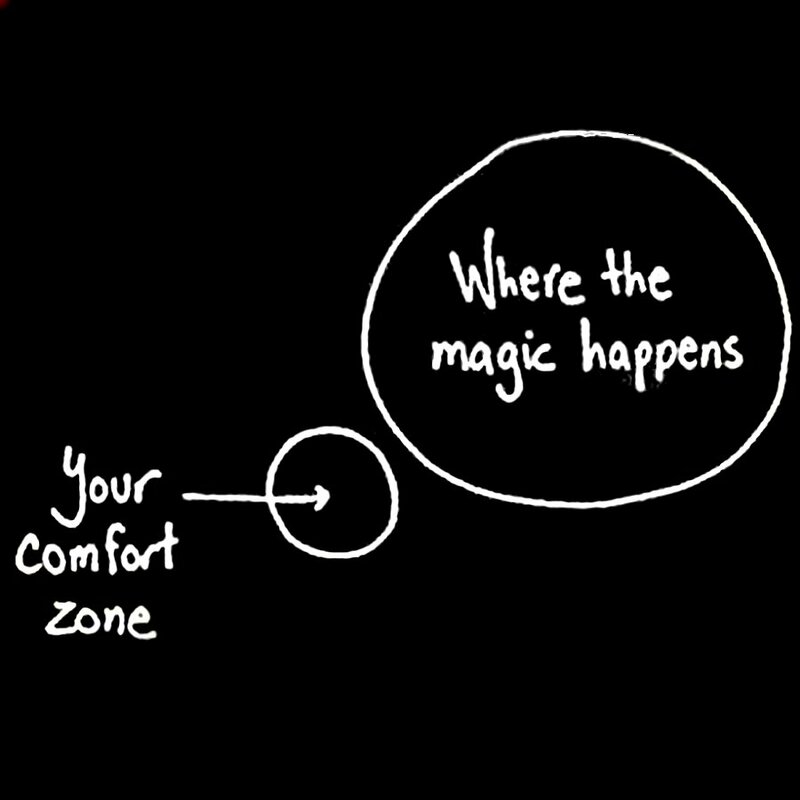 Where the magic happens…. so I’m told. I went to my local shopping center, a place I know pretty well. Unfortunately, with the vision I have, my confidence was challenged. Good thing I brought some extra confidence with me! Pheeew! I walked by storefronts, concentrating on which store was which, or what I remember them to be. I walked across the parking lot… not once, but twice! It wasn’t busy…so that really helped with my huge fear of getting hit by that car I didn’t see! I asked for assistance in each store and I kept my requests simple. Baby steps. With a grocery bag, a coffee, and my cane in hand, I caught an Uber ride home. That ride gave me a moment to think about what I just accomplished. I could feel the emotions rising up from my rotten little core. The flow of tears were coming on, not because of the fear I felt with vision loss. NO, not THIS time. I was emotional because of how FEARLESS I felt with vision loss. This little trek out of my blind comfort zone, was one of the biggest leaps I’ve taken as a Girl Gone Blind. Yep, *snaps fingers* and that magic is mighty fine! So proud of you! My tears are flowing too! Love you! Good for you! Huge step! Never doubted for a minute that you could do it. Hey, you & Blind Guy Chris made it to PF Chang’s!!! So proud of you Maria! You’re an inspiration to all and you will conquer anything that comes in your way. That is awesome Maria!! You truly do inspire me! This brought tears to my eyes! You’ve come a long way, Baby! Congratulations! I am so happy for you ms. Maria! Stepping out of your comfort zone is a giant step. I’m happy to hear your adventure went well. Baby steps. Wishing you all the best on your path. Bless you. Ever since I lost my vision, many people have said, “Carla you’re so brave, I could never go through what you’re going through!” But my response is always the same: Yes, you could do it if you too had lost your vision. I don’t like to be called “brave” since I’m actually quite a chicken. But this week you might say I was brave. Unfortunately, on Monday my 90 year-old-mother passed away peacefully in her sleep in hospice care in Florida. So given little choice, I had to fly from Milwaukee to attend the funeral. Being new to blindness, I’m still trying to ride city buses let alone navigate an airport. So Wednesday I bravely took two city buses at 4 a.m. to get to the airport where I tapped myself around to actually get on an airplane for the first time as a blind woman. It was hard, but I did it. But flying back home today was a different story. I guess I was naïve to think that I would be an expert blind traveler after just half of a trip. I had a humiliating experience that I hope none of you go through. After working through the line to the baggage check area, l had successfully put my purse, luggage and laptop onto the rolling rack and heard it all roll down the track. Then as I walked into the human scanner, the TSA lady saw me tapping my way to the scanner and tersely exclaimed, “No canes!” So she took my cane and gave me what seemed to be a regular cane, likely made of non-metal material that would not set off the alarms. But as I started to walk through, she grabbed my arms and proceeded to pull me through the scanner, but I immediately lost my balance causing me to smash into the edge of the scanner and go hurtling down to the ground. The sighted people around me gasped in horror at the incident. I got up in tears facing the ongoing frustration of being blind, and said to the agent, “Let’s try this again, but this time, just let me walk through the scanner on my own. She reluctantly agreed, and I of course easily sailed right through without falling, tripping or injuring anyone, all to their amazement that a blind woman could navigate through without their help. As I get to be much more bold in my blindness, after I walked through and picked up my things, I told her quite forcefully that she should not pull blind people around and let them be guided by her voice or let them hold their elbow. She acknowledged me, walked away and just screamed out, “Next!” to the ensuing victims. As I’ve said in other missives, blindness is not the issue; it’s managing the sighted people around me. I hope the rest of my journey is more successful. Safe travels everone! I’ve still got a decent amount of useable sight in my left eye & have always had roughly the same level of sight i have now, but god can i relate to this! I’m only comfortable going to and getting around our local town on my own. Our village is a no go though because OMG what if i walk into / ignore / look like an idiot in front of someone i know?! Anyway before i get completely sidetracked i starting writing this comment to say the sense of achievement from getting my bum out of my comfort zone is THE BEST feeling EVER, and YOU GO GIRL!